Play the best guitar hero styled game. Music hero has advanced 3D graphics, beautiful lightening effects and animations with a brand new visual experience. Improve your music skills and train your precision reflexes with this unique and fun game. How fast can your fingers tap the beats and stars? 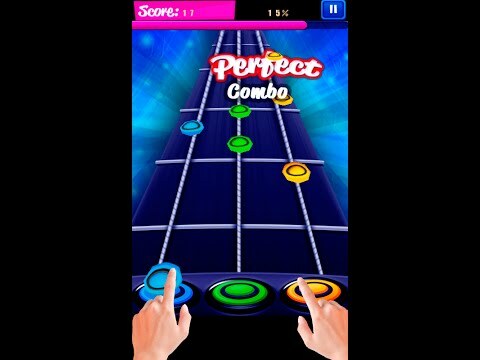 Hit perfect combos to become a true guitar hero. Compete with friends and family, set records beat global high scores, achievements and be a champion. How to play: - Tap the yellow, blue, green and star discs as they pass down the screen to score points for accuracy and timing. 2. Incredible preloaded midi creative commons songs from various genres including electric, rock, disco, rap, rnb, classic hero, gospel, contemporary and many more. 6. Better controls and stunning gameplay! Enjoy hours of fun playing the best music game ever.